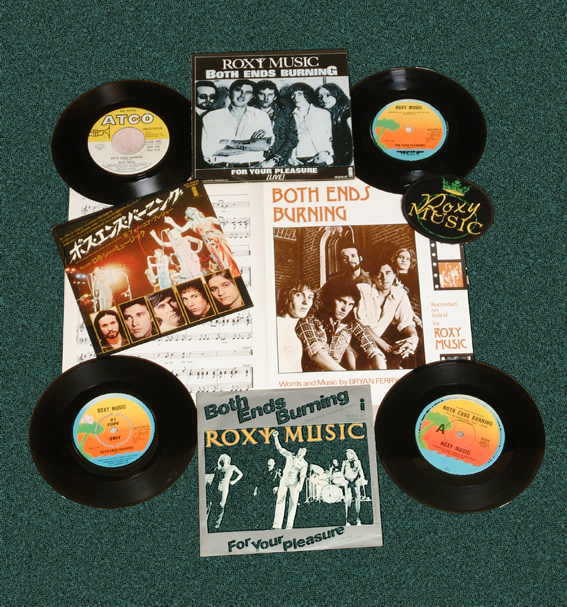 Lyrics to the song Both Ends Burning as recorded by Roxy Music. Do I have the speed to carry on? Somewhere deep in my soul tonight? Hell, who can sleep in this heat this night? Tell me what is there to save tonight? This was the second single release from Roxy Music's Siren album. released in December 1975 and climbing to a peak of number 25 during its 7 weeks on the UK charts. The song was featured in the Siren tour and also the Flesh + Blood (1980), Avalon (1982), the re-union tour in 2001 and Bryan Ferry's Frantic tour. Bryan also performed this on his 2014 tour. The single was coupled with a live version of For Your Pleasure. Both Ends Burning was also used as the b-side to Love Is The drug in USA. Both Ends Burning has been covered by Ghost Dance on their River Of No Return EP and a Dutch Band Fatal Flowers. "We were on a punishing world tour schedule in 1975 and there were a lot of late nights to get the Siren album finished on time. I guess this was the inspiration behind this song."